In 2009, dengue-transmitting Aedes aegypti mosquitoes were found in the Himalayas for the first time. Scientists believe that the spread of dengue across Nepal is caused by climate change. When dengue fever swept through his neighbourhood in September 2016, Mr Dambar Jung Rana's family was not spared. His three-year-old daughter, Aaradhya, fell ill and had to be hospitalised. His 57-year-old father was infected as well. Both were warded in hospitals across the road from each other in Bharatpur, Nepal's fourth-largest city. Each day after work, Mr Rana would travel there to be with his family. The hotel receptionist recounted how his daughter, in particular, suffered from the disease. "I had to sleep in hospital with my daughter because she didn't know what was going on," said the 32-year-old. "She was scared and kept saying that she wanted to go home." He added: "I saw my loved ones in pain and that was very hurtful for me and my family." Mr Rana lives in the Ratnanagar district, about half an hour's drive from Bharatpur. It is located in Nepal's lowlands, where temperatures can exceed 30 deg C. Pools of stagnant water can be found near water pumps or in clogged drains and discarded bottles. These factors make the area a perfect habitat for mosquitoes to breed and spread disease. Residents said that during the 2016 outbreak, nearly every household had one member come down with dengue. 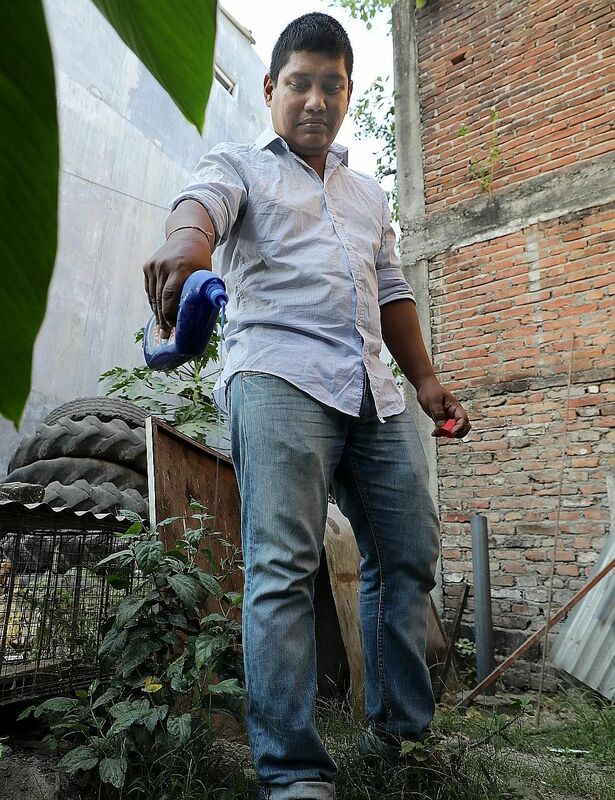 Even though many people - including Mr Rana - sleep beneath mosquito nets, these provide little protection against the dengue-carrying Aedes aegypti mosquito, which bites during the day. After his family was infected, Mr Rana rallied his neighbours to clean up the neighbourhood and get rid of mosquitoes. "We treated the water to prevent mosquitoes from laying eggs, cleared the blocked gutters and threw away the plastic bottles," he said. Dengue fever has not been a problem in Ratnanagar this year, so the 50-member "anti-dengue club" has turned its attention to the area's unpaved roads instead. Clouds of dust are often thrown up by passing vehicles, which aggravate respiratory problems for those living there. "It is not only my problem," Mr Rana said. "It is the problem of everyone living here."